The convention in Portland, Oregon, was inspiring on so many levels. The way that the information was stuctured and given out to us was both simple and profound. The asanas were presented in the order in which they are given to the “patient”. The order of the poses also reflected the development of a baby. Each pose, of course, is practiced in a way that is relevant to the person’s condition, injury, or age. The first day of the convention was all about variations of Savasana (a new born baby’s position is a laying down position). First you teach the student/patient to be quiet. You also relax tense muscles, organs and nerves. The baby lies on it’s side. Here, among other poses, we were going to practice and discuss Anantasana, but there was no time, so this was omitted. Next, observe and teach the sitting and twisting poses. The baby sits up. The patient will not be strong enough yet for standing poses. Then we looked at the supported standing poses. The baby stands. We did a little asana on the way through, but not much, as we were mostly either listening, or watching, or working on each other in very supported poses. One pose that stood out that we did practice during the back bend segment was salabhasana with the arms threaded through a double or triple wrapped long rope. Try it, and don’t come out of it too soon, and tell me how your triceps feel the next day! Inversions were next. Even the baby once it can stand, will stand with it’s legs apart and look through it’s legs, in a “half inversion” at it’s Mother! Our last class was pranayama. Later that evening we were entertained by some wonderful Indian musicians. 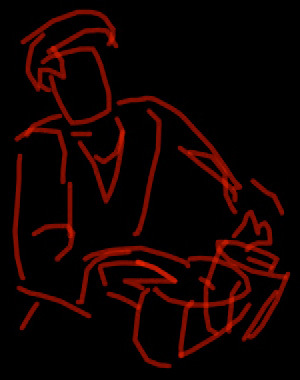 I drew this picture of the tabla player on my iphone. There were five-hundred delegates, all certified Iyengar teachers, and twenty percent of them came from abroad. It was a marvelous coming together of old friends and like-minded souls. Geetaji’s teaching was brilliant. I flew home back to New New York on Sunday night and then taught all day Monday. Despite my tiredness, I was energized by Geetaji’s teaching and humbled by her dedication to those who are in need of help. Therefore the yogis meditate in a dark mountain cave. Peace flows serene and inexhaustible. seated alone in the shrine of samadhi? with laughter terrible and loud!